X-ray Photoelectron Spectroscopy (XPS) also referred to as Electron Spectroscopy for chemical analysis (ESCA) was used to characterize the surfaces of plasma-chemical treated wood in air by dielectric barrier discharge (DBD). The plasma-surface pre-treatment of wood, wooden products and cellulosic fibrous materials has been developed for promoting capillary impregnation and plasma-aided flame retardency. In this study, XPS has been used since it has proved to be suitable investigation method to characterize the composition of a plasma pre-treated material surface. This method is a powerful analytical and non-destructive technique which has already been used for the analysis of plasma modified wood surfaces and in the characterization of wood’s reactions. Changes due to the plasma-chemical process were identified from the survey large spectra as well as from the detailed C and O spectra. The oxidative changes were quantified with the 1s 1s atomic ratio of oxygen to carbon and with a detailed analysis of the contributions to the C and O peaks. Results of researches are showed, that fabrication technology of sensor elements are used in devices based on surface plasmon resonance significantly affects on the increasing uptime of measuring and substantially increases the sensitivity to low concentrations of analytes. The results of investigations have shown that deposition of plasmonexciting metal layer on glass substrate at the chosen angle enables to enhance sensitivity of the surface plasmon resonance sensor by 1.5 times for liquid media and 2 times for gas-like media as compared with standard gold chips as well as improve uniformity of deposition and durability of ligand binding to the sensitive layer. Diagnostic facilities based on surface plasmon resonance possess a high sensitivity to low concentrations of studied substances, which enables one to use them as precise analytical devices in lab investigations in industry, agriculture, medicine, and ecology. The article describes the influence of the position of the swash plate axis of rotation on the size of the dead space and the volumetric efficiency of the axial pistons pump. Superposition of the two motions have been proposed – the rotation of the swash plate with respect to axis intersecting the axis of rotation of the pump shaft and the shifts of swash plate yielding a result of the rotation axis offset effect. In the article it is also made the comparison of the volumetric efficiency of the pump with the axis intersecting with the axis of rotation, and the construction with the shifted axis. The possibilities of regression analysis to model the properties and the related to it multicriteria optimization of the composition of titanium alloys are introduced in the presented research. This is done after performing characteristics of established applications of various titanium alloys. 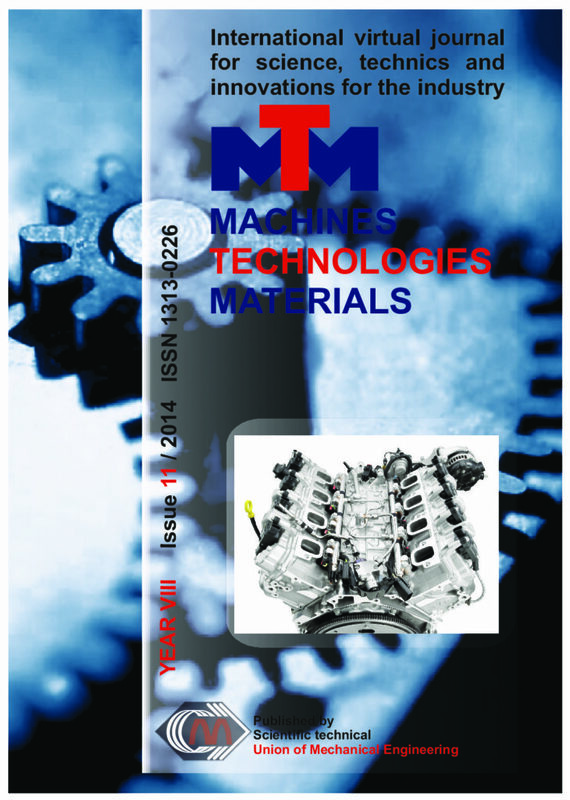 To predict elongation in this paper there have been obtained nonlinear regression models that allow to estimate the strength properties and the plasticity depending on the equivalents for aluminum and molybdenum for titanium alloys. Production planning for the replacement of conventional manufacturing systems by new automated process chains is a com- plex activity particularly when it comes to choosing the right processes, materials and technologies. Nowadays those new process chains have to fulfil constraints such as low energy consumption and have to be resource-efficient and cost-efficient at the same time. The decision- making process can be a difficult task for authorities especially when the uncertainty of the input parameter has to be taken into account, such as prices for electricity, raw materials and lot sizes. This paper proposes a new decision-making model based on multidimensional key performance indicators (KPIs) that represent an economic and environmental objective as well as a performance objective. An approach to the study of the relationship between the extreme values of the mechanical properties of titanium alloys . The approach is based on the approximated dependence of the mechanical properties of the chemical composition of the alloy of the ANN model . Approximating dependencies are included in the genetic optimization model based on optimization algorithm NSGA II, which was built by Pareto – fronts , modeling the relationship between the studied mechanical parameters. The paper presents the application of modern computational approaches in determining the appropriate chemical composition of titanium alloys . Discusses three types of problems for the selection of the chemical composition of alloy at set requirements for mechanical properties . Tasks are solved in a different formulation of the target criteria . The proposed solutions are based on software model using approximation with artificial neural networks and genetic optimization algorithm. The EA Signal tests registered during the static stretching of the X6CrNiTi18-10 steel (according to EN 10088) have been o included in the work. The tests were done in the room temperature and in the high temperature of – 400 C on the universal strength (tensile) machine ZDM-5 with the range of 0-50 kN equipped with the digital registration of the strength and stretching. The analysis of the EA signal intensity has been conducted, depending on the deformation of the sample and test temperature. On the basis of the EA signal there have been the own characteristic oscillation frequencies of the samples designated, being the effect of the degradation of the structure as a result of the increased load. Turbine blades used in the jet engines are subjected to frequent and rapid temperature changes. As a result of the hot gases influence the temperatures excess 1000°C. Certain conditions for the blades generate local thermal stresses. In this paper the thermal stresses are calculated on base on experimental measurements of the temperature distributions using the high resolution thermal imaging camera FLIR SC7000 registered the distribution of temperature field for the blades with TBC and without TBC. The distribution of stresses in the blades based on the collected measurement data has been calculated. The calculations were made using FEM method implemented in COMSOL. The paper presents comparison of microstructures of hafnium modified aluminide coatings deposited in two different ways on pure nickel. In the first way a hafnium layer was deposited by the EB-PVD method, subjected to the diffusion treatment for 6 hours and than aluminum was deposited by the CVD method. In the second method, double layers of hafnium (3 μm thick) and aluminum (3 μm thick) were 0 deposited by the EB-PVD method on the nickel substrate. The double layers were subjected to diffusion treatment at 1050 C for 6 h. The obtained coatings were examined by the use of an optical microscope (microstructure and coating thickness) and a scanning electron microscope (chemical composition on the cross-section of the modified aluminide coating). In aluminide coatings deposited by the CVD process, an outward nickel diffusion via the hafnium layer and inward aluminum diffusion to the surface of nickel lead to the formation of a diffusion zone. Hafnium forms a layer of intermatallic phases with nickel in the diffusion zone. Diffusion treatment for 6 h of nickel with hafnium and aluminum layer leads to formation of the Ni5Hf phase. Zirconium was introduced to the aluminide coating by means of two methods: the EB-PVD method and the CVD method. Zirconium layers (1 and 3 µm thick) were deposited by the EB-PVD method on the pure nickel substrate. Than samples were aluminized by the CVD method. Aluminizing process leads to obtain triple zone coatings. The top ß-NiAl zone, the middle γ’-Ni3 Al zone and the inner γ – Ni(Al) zone were observed. Intermetallic phases NiZr(NiZr2 ) and Ni5Zr on the border between the top and the middle zone and middle zone and thesubstrate were found. When zirconium was introduced to the aluminide coating during the CVD process a triple zone coating was obtained. It was found that zirconium is dissolved in the NiAl phase. Thermography measurements allow to detect the defects that may appear on a joint at welding of components. Energy pulse generated by a xenon lamp with adequate power in a short period of time is sufficient for thermal excitation and enables to register the temperature distribution using the thermography high resolution camera FLIR SC7000. The impulse with 6kJ energy and 6ms time generate sufficient power to measure the temperature distribution on the surface of the weld tested. During cooling the temperature of the area with defect changes more slowly than in the areas without defects, because of to the less intense heat dissipation. This allows the registration of defects in welds "on-line" at the production process. Material used for analysis detection of defects in the welded joints is Inconel 718, stainless steel 410 and stainless steel 321. The peak energy which flow throw the samples with defects in the welded joints its completely or partially blocked. It cause different temperature distribution on the surface in the places where the connection discontinuity take place. The scanning nozzle hot air system for thermographic detection of the surface incorporated hidden defects is proposed. Subsurface defects in the sample are detected using the high resolution thermal imaging camera FLIR SC7000. To introduce additional energy in are searched sample, a scanning hot air (about 110°C) nozzle is applied (a patent application P.403346). The hidden defect causes a temperature increase in comparison with the remaining area what is a result of changes in emissivity. The results are compared with the pulse thermography method using the xenon lamp for excitation.